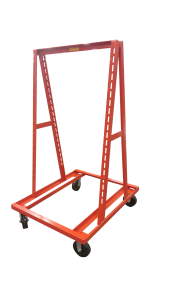 The Ver-T-Rack System is the most adaptable, mobile, adjustable, and interchangable material handling system available. From Ver-T-Racks and Ver-T-Leaf Trucks for transporting parts and finished goods to Ver-T-Benches for assembly, you design the system that fits your operation best. Ver-T-Rack support structures are constructed from strong, angle-iron, grouptwoall welded components. Precision designed and fabricated, Ver-T-Rack support structures resist sudden impacts and strains encountered from uneven floors and physical obstacles. Trays are constructed of 16 gauge steel with 500 lb capacity per tray. Equipped with standard drop handles.